The game does not require Steam running. A free prototype version is available. 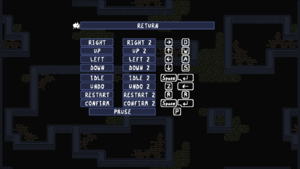 As movement is grid-based, input repeat delay setting determines delay on when the action is repeated if the key is being held down. Uses desktop resolution with anamorphic scaling from 854x480. 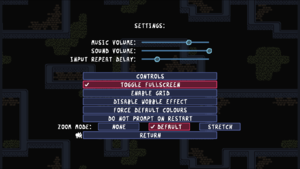 Zoom modes none (no scaling), default (pixel-perfect) and stretched (anamorphic) applies to game area. Defaults to 854x480, freely resizeable window, anamorphic. Two keys for all actions, Esc hardcoded for primary pause. 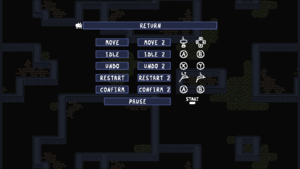 Cursor stays on the screen, on launch moved to top left area outside gameplay. Two buttons per action, movement rebinding limited to d-pad and axes. V1, V2, Wireless Adaptor. Wired, Bluetooth. 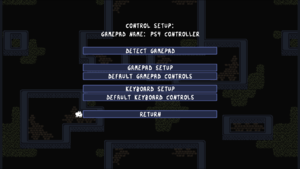 If controller isn't detected, add SDL2 string into <path-to-game>\gamecontrollerdb.txt, see Controller: SDL2 for more information. Common fixes for technical issues and General bug report thread in Steam community, updated by developers. Change Ansel status to Disabled and press Save. See Nvidia: Ansel for more details. Try disabling Steam overlay, Xbox game bar, Nvidia Shadowplay and other overlays you might have enabled. Right click game, open properties, select local files tab, press browse local files. 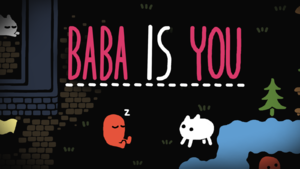 Double click Baba Is You.exe. Developer is aware of the issue and is working with those having the issue. Download and install DirectX End-User Runtimes (June 2010). "Getting in touch with people who've had audio problems through Steam. We rolled back the audio update, but I'll take some time to debug with everyone to make sure things are fixed for the next update :)"
This page was last edited on 5 April 2019, at 08:56.